Are we worthy of our children? Each and every child at Knight Hall School is a marvel. Each and every day each teacher helps every child see just how spectacular they are. Please take 2 minutes to watch this video. It will brighten your day! Ann, more than a preschool teacher! Please click on this link to see Ann’s amazing accomplishment! Teacher by day, actor by night! You may be surprised to learn that our teaching staff have many talents! Bev, who teaches in the Blue Room, showcased her talents this past weekend in, Shrek, the Musical! The show opened at the Warner Theater in Torrington, Ct this past Friday. Many of the children from Knight Hall have or plan to attend! Sam’s mom shared this photo of Sam meeting up with Bev after the show. Sam seems to be very proud to call this little piggy his teacher!!! Tickets are still available. The show runs through August 4, 2013. If you give a child a muffin…. If you are familiar with children’s literature you will recognize our play on words! 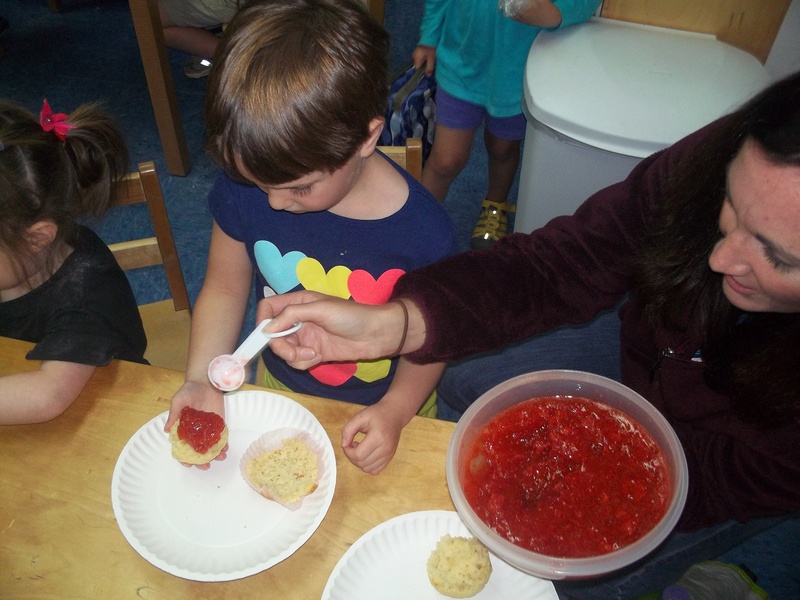 The Blue Room made strawberry jam and muffins and there is no better book to pair with that project than If You Give a Moose a Muffin by Laura Numeroff . What excitement to see all of the strawberries they so carefully cut up actually turn into jam! 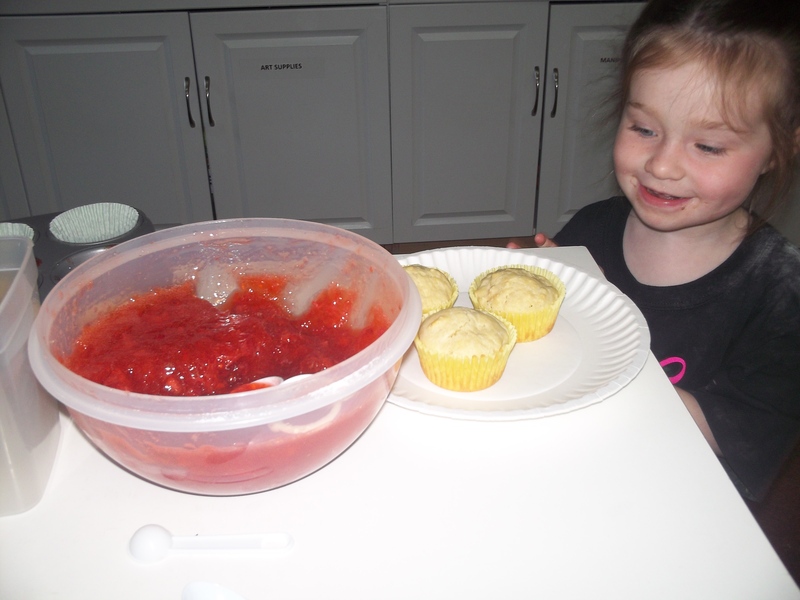 On Tuesday, the Blue Room children mixed sugar and pectin and all 4 lbs. of strawberries into a large bowl and put it in the refrigerator over night. 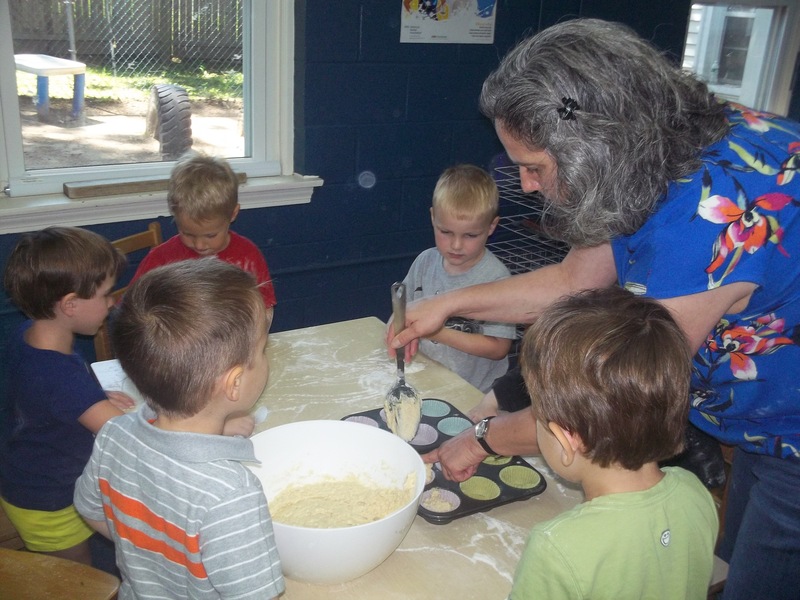 On Wednesday, they made muffins from scratch. When they had cooled just enough, they paired the warm muffins with a heaping spoonful of jam (or two or three) and enjoyed every last crumb/drop. Stop by the Blue Room over the next few days to see the children create sock puppets, just as the Moose in the story did! Congratulations and THANK YOU!!! A BIG, heartfelt thank you to everyone in the Knight Hall community who contributed to our ANNUAL FUNDRAISING CAMPAIGN. Donations topped $2,643, and with the match from our anonymous donor ($2,700), the total is $5,343. Every dollar counts and this money will further enhance the education of children at KHS and the resources that our teachers have to work with. Make-over – KHS style! Another round of thanks to all of the parent volunteers who rolled up their sleeves and helped to renovate Martha’s office on the Spring Clean Up Day held in April. A few coats of paint, a new rug, and some donated couches have really spruced up both Martha’s office and the Teachers’ Lounge. If you haven’t been to the second floor yet to see the transformation, be sure to take a quick peek! Year End Celebration – Bushnell Park Carousel. Given the positive feedback that the carousel event received last fall, KHS has reserved the Bushnell Park Carousel for another family night out of rides, pizza and community (and, it’s free! Rides and light dinner included). Mark your calendars for Wednesday, June 19 from 6-7PM. Please RSVP directly to your child’s teacher. SHREK, the Musical. Did you know that we have a talented stage performer in our midst at Knight Hall School??!! Bev Delventhal-Sali, a teacher in our Blue Room, will be performing this summer in Shrek, the Musical at the Warner Theatre in Torrington, the last weekend in July and first weekend in August. Be sure to get your tickets to support our local talent! You can use the coupon code “FreakFlag” to purchase $20 orchestra seats (www.warnertheatre.org). AFP Grant/NAEYC Accreditation Update. KHS continues its work towards NAEYC accreditation. Teachers are attending and will be attending workshops and classes. Martha just completed a 3 credit class on leadership and management. Louise, Betsy, Christina and Martha just completed 12 hours of Creative Curriculum training and Louise and Stephanie just completed a 6 hour Babies class. Ann and Bev will be attending a math workshop in August with nationally known preschool math educator, Juanita Copley. During the summer the teaching staff will be working on their classrooms, bringing new ideas and less clutter. Jodi Takiff, mom to Ella in the Purple Room and a preschool teacher in Middletown, will be doing a workshop with the teachers on building their classroom portfolio. The process is long and the work is deep. The road to accreditation is all in the process! Safety Updates. To follow up on our safety assessment from the winter, after consultation with public safety professionals, KHS has adopted a “deterrence” strategy – which means having each classroom equipped with elements that would make any sort of intrusion less likely and less attractive. Each classroom now has doorstops (that will be used from the inside to prevent someone from the outside getting in), window blinds, and will have (if it does not have already) a curtain to cover any windows in the classroom door. Limiting visibility and accessibility is the simplest way to deter an intruder. Additionally, earlier this year Martha attended a West Hartford Police Department workshop addressing similar safety issues and has been recognized for being one of the few child care center directors who has focused on these safety issues. Thank you, Martha! Go Ann! The Pan-Mass Challenge. Once again this summer, Orange Room teacher, Ann Monseglio will be bike riding from to raise money for cancer research and treatment at the Dana-Farber Cancer Institute. Ann is a breast cancer survivor who has participated in this event in years past, raising thousands of dollars for the cause. Please be sure to wish her well in her training and on race days, August 3 and 4. PURPLE – The children of the Purple Room have been watching as the caterpillars turned into chrysalis and then into butterflies. The excitement of watching the butterflies is audible! RED – The Red Room children have been very busy learning about different types of building materials. Using the very large blocks in the shared area and borrowing some very strange looking building blocks from the Orange Room, the children have learned to strategize, compromise and create! YELLOW – Butterflies, butterflies everywhere! The Yellow Room children have looked at the life cycle of butterflies. Gaining a wonderful understanding of how a caterpillar metamorphoses into a butterfly! BLUE – Blue Room children recently took a field trip to see “Goodnight, Moon” at the Playhouse on Park with the Orange Room; produced and starred in a film production of “The Very Hungry Caterpillar” and celebrated with an awards presentation to parents; and visited the CRRA Trash Museum in Hartford to learn what those garbage trucks do with all their pickups and recycling. ORANGE – The children of the Orange Room have all been on a kindergarten visit! Each child has come back to school, very excited to share something special about their soon to be new school. They are ready! Every year the Orange Room tye dyes t-shirts in anticipation of their big trip to the Groton Submarine Base. This is a right of passage for the children of the Orange Room! They recently donned their tye-dye shirts and descended on the base for an up close and personal tour of a real submarine! A great time was had by all! A special thank you to our departing Board members: Kelly Hathorn, Cindy Mahon and Kate Mylod. If any parents have an interest in serving on the 2013-2014 Board, please see Martha! Please be sure your child has suntan lotion, a swimsuit, towel, water shoes and a change of clothes and underwear in his/her cubby at school. Please be sure to send your child to school with suntan lotion already applied. Teachers will reapply for the afternoon. KHS will be closed Thursday, July 4 for the Independence Day holiday. We have discovered that a family of 7 baby skunks and their mom have taken up residence at Knight Hall School, more specifically, under our front porch! The children I the Red and Purple rooms (toddlers) were able to watch them waddle across our front playgrounds on a rainy afternoon. The class rooms were a buzz with excitement! We did have to call a wildlife specialist to come and set “save a heart” traps. It will be interesting and intriguing to watch as we catch the skunks, from a far mind you! I was told that baby skunks can spray, they just have no control of the direction! I can just imagine what will be happening in all of our classrooms as we go through the process of catching the skunks. Math, science, social studies, there are no limits!!!! I’ll keep you posted! The KHS Annual Campaign is in full swing! While we don’t want to bombard you with too many messages, we do want to share the good news that we have raised $1,396.00 so far! Each of these dollars will be subject to an anonymous match, so that is really $ 2,792.00 for KHS! Woohoo!!! We still need your help to reach our $5,000 goal. If you haven’t had a chance to donate and wish to do so, remember that each dollar donated between now and May 15 (just 8 days left!) receives the benefit of the dollar for dollar match ($5000 is the cap), so help us double up! As a reminder, donations can be made by check (mail or drop off) or at www.gofundme.com/2ap3yo . Please consider forwarding this email to friends and family as well. Purple Room (Infants) : The Purple Room children have been very busy exploring buckles, locks and balls! Working on puzzles that have many different forms of locks, fun to open and close! They love the pillow that has every kind of buckle known to man! And balls, balls everywhere!!! The Purple Room is on the move and exploring their world! Red Room (Young Toddlers): The children discovered new blocks! These blocks were built by an Orange Room parent, but loved by all of the children. I witnessed some pretty impressive uses incorporating many different types of props! Yellow Room ( 2 – 3 Year-Olds): How many ways can you paint? Ask the children in the Yellow Room! They have painted with sponges, sand balls, and brushes! They’ve also been growing individual sunflowers and little tubs of grass – wonderful discussions about Spring, nature, and growing. Blue Room (Pre-School 3): The students made “birdseed babies” and practiced caring for them. How much fun it was to see all these little “parents” taking care of their young. Orange Room (Pre-School 4): Do you know how big our parking lot is? No? Go ask an Orange Roomer! They measured the parking lot; using many creative forms of measurement they really began to understand the process of measurement! As always, thanks for your support of Knight Hall School!